This motto has served the band well. Not even the Imagination Movers themselves could have fully imagined their breakthrough success. The Movers partnered with Disney in 2007 and filmed 75 episodes of their Emmy Award-winning series over three seasons. The show aired in more than 55 countries and they’ve sold half a million CDs and DVDs to date. Critical acclaim for the Movers includes nods from Entertainment Weekly and The New York Times, which reported the Movers are “prized by many parents for non-condescending lyrics and music that evokes the Beastie Boys or Red Hot Chili Peppers.” Parenting magazine praised the band’s “dash of rebellion” and songs that are “fresh and treacle-free.” National television appearances include The View, Live with Regis & Kelly, and Good Morning America. The Movers earned a Daytime Emmy Award from the National Academy of Television Arts & Sciences for outstanding original song in the children's show/animation category. The series can usually be found On Demand through various cable providers and on the Disney NOW app. Imagination Movers developed an animated series “Super Movers” in partnership with Toronto-based 9 Story Media Group, and is presently looking for a partner network. The series trailer received over 200,000 views in its first seven days while the song hit number 1 on the Children's charts in Canada and the US. The Movers are known as a high-energy, interactive live music act. Over the last decade, they have entertained more than a million fans in North America, Europe, and Asia. Their 2011 “In a Big Warehouse” tour attracted 150,000 fans and was one of Pollstar magazine’s top 100 tours of the year (one of only two family acts on the list). 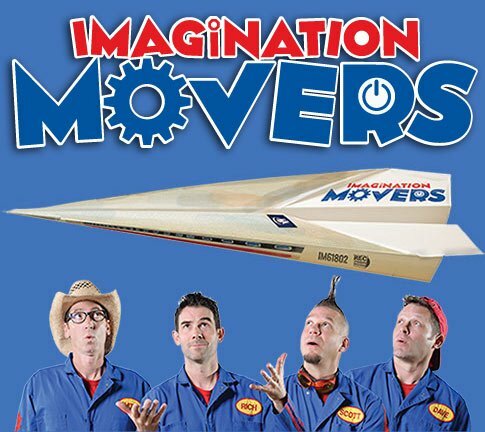 According to thousands of fan reviews on Ticketmaster.com, Imagination Movers ranks as the No. 1 rated major touring act for families. With 98 percent of concertgoers recommending a Movers’ concert to friends and family. Over the past two years alone the Movers have rocked packed houses in the U.S., Canada, Japan, Guam, Spain, Italy, Germany, and the United Kingdom. Presently, the Movers are finishing up the recording on their 10th album to be released in early 2018.